One of the companies working to put Arm processors into the cloud is Ampere, and the proliferation of Arm in the cloud is continuing to grow. Cloud company Packet is now offering a new instance which combines Ampere’s eMAG processor with 32 Skylark cores, a turbo up to 3.3 GHz, 128 GB of DRAM, a 480 GB SSD, and dual 10 Gbps networking. Ampere was formed by ex-Intel President Renée James and is funded by The Carlyle Group, with the company purchasing AppliedMicro’s X-Gene Arm server assets back in 2018, and introduced the first generation of eMAG processors in September of the same year, which was essentially the X-Gene II platform with optimizations. The custom Arm v8.0-A core design is built on TSMCs 16FF+ process and runs at 3.3 GHz in turbo mode. The full 32-core chip has a rated TDP of 125W, features support for eight memory channels and up to 1TB of memory. The c2.large.arm instance from Packet is the first instance of the eMAG Skylark design being used in a publicly available cloud instance, allowing customers to both develop for the platform as well as develop cloud services. Depending on who you talk to, the $1/hr pricing has both been interpreted as very reasonable or very high depending on which industry analyst you talk to, and based on our discussions with Ampere at Mobile World Congress this year, one of the key elements of the company is to get more users introduced to the platform for cloud and edge services. 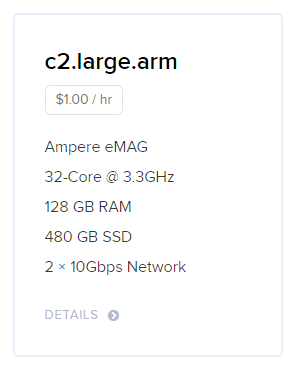 The company believes that the eMAG product offers a very competitive total cost of ownership (TCO) value for high performance compute, high memory capacity, and rich I/O. That being said, the instance offering from Packet is more on the development or HPC side, rather than probing the memory or IO. Ampere and Packet are also looking at ‘Edge’ deployments for companies that require a localised eMAG based infrastructure. We’re hoping to get a Skylark based platform in for review at some point, as it will provide a good comparison point against other non-x86 attempts to provide distinct cloud offerings.